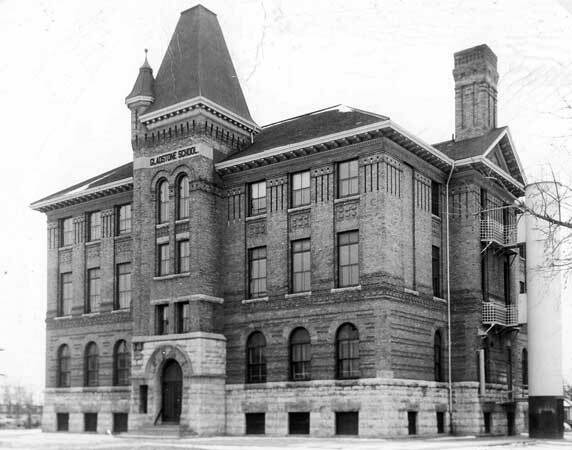 Pembina School was a two-room structure built in 1898 at the corner of Osborne, Corydon, and McMillan, in the Fort Rouge area of Winnipeg. Soon after it opened, it was destroyed by fire and a replacement was constructed later that year. The new school’s cornerstone was laid by D. W. Bole at a ceremony on 31 August 1898. Inside it was the most recent copy of the Winnipeg School Board’s Annual Report, along with copies of local newspapers, a statement of costs from the contractors and the architect for the school, School Board bylaws, and a copy of the Manitoba Schools Act. Named for British Prime Minister W. E. Gladstone, who had died in the year of its construction, the new Gladstone School was a three-storey brick structure designed by local architect J. H. G. Russell and constructed by D. D. Wood. Enlarged in 1902, it served the community until mid-1962, when the building was demolished. It was replaced by the present two-storey Gladstone School on the opposite side of the original playground, facing Gertrude Street. Among the noteworthy students who attended Gladstone School were Ewart Morgan, Norman Young, Theodore Webb, Charles Nash, Arthur Webb, Wallace Nicholson, Jack Aldous, Harry Aldous, Victor Tait, Allan Hart, Ernest Hicks, Dr. Vernon Leach, C. D. Campbell, and Ralph Burchard. Mrs. E. Buchanan, Mrs. D. Byers, Miss N. Jenkins, ? Mrs. D Black, Mrs. E. Buchanan, Mrs. D. Byers, ? Mrs. D Black, Mrs. E. Buchanan, Mrs. D. Byers, D. Morris, ? “A new school,” Winnipeg Daily Tribune, 1 September 1898, page 5. “Winnipeg schools, No. 10—Gladstone,” Manitoba Free Press, 26 October 1922, page 4. “Every election day a Gladstone School reunion” by Claire Tisdale, Winnipeg Free Press, 2 February 1949. 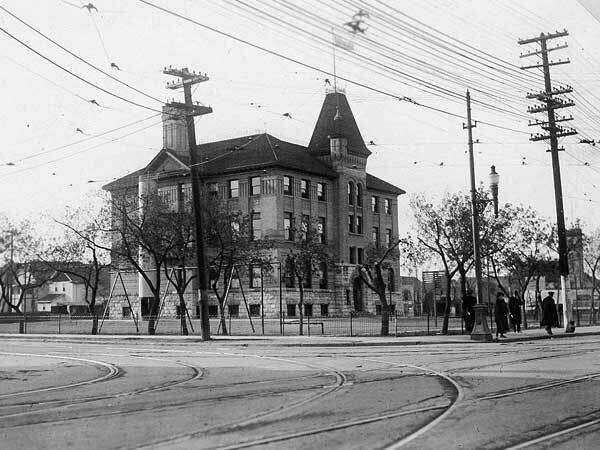 “This Old School: Gladstone School, 500 Gertrude Avenue” by Reid Dickie, Winnipeg Free Press, 29 May 2004, page H3. We thank the Winnipeg School Division and Walter Turchyn for providing additional information used here.